Cold days are all about layers, cups of coffee or tea and bundling under piles of blankets. If you’re like me, you may favor turning on the oven and whipping up some sweet treats. 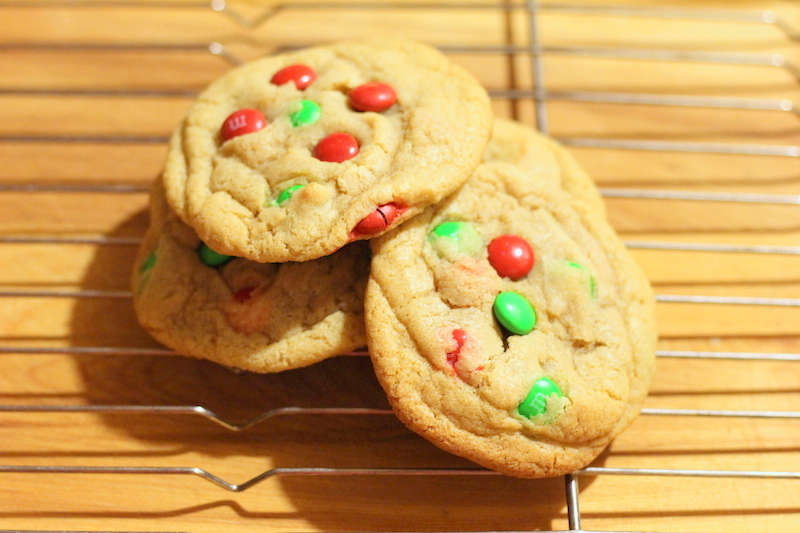 These cookies were made a month ago around Christmas (the red and green m&m’s make it quite obvious) and were briefly mentioned in my last recipe post. 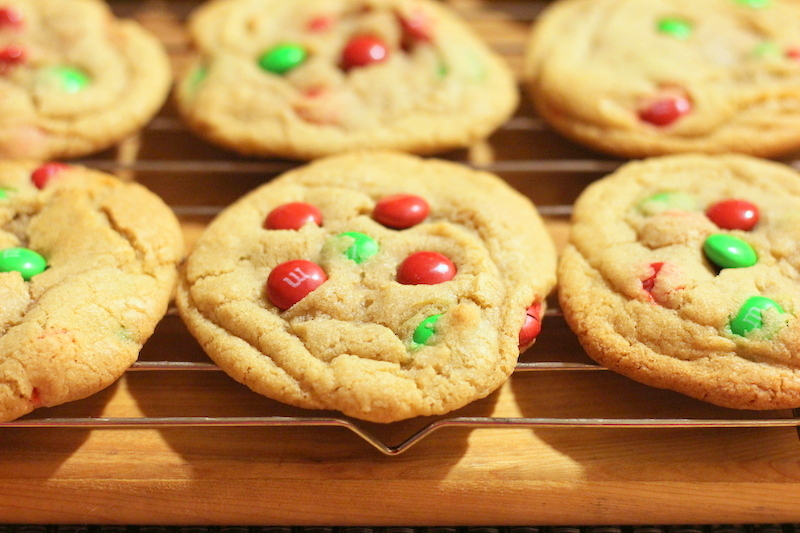 In this recipe, the cookie dough base is a simple and basic kind that allows you to add anything you want besides m&m’s if you prefer not to use them. Another interesting thing is the stacking of the cookie dough when placing them on the cookie sheet. This causes the cookies to have a puffy look once they’re baked up. These are also easy to make so give them a try. 2. Mix the flour and baking soda in a bowl and set aside. 3. In another bowl, mix the butter and sugars until they are combined. Add the egg, egg yolk, and vanilla and stir until mixed. Gradually add flour and mix until a dough forms (the author says it will look crumbly at first, but it will come together). 5. Fold in the m&m’s. 6. Divide the dough how you choose (the author suggests 1/4 cup portions for 18 large cookies or 2 tablespoon portions for 36 smaller cookies). Shape each portion into a ball with your hands then pull each ball into two equal pieces. Turn each half so that the rough side of the half (what used to be the inside of the ball) faces upwards and then squish both halves together. 7. Place the dough rough-side up on a baking sheets. If you’re doing large cookies, leave about 2 inches in between each. 8. Bake for 12-15 minutes (large cookies) or 8-12 minutes (small cookies) or until the edges are slightly brown. The centers should be soft and puffy. Do not over bake. Let cool completely.